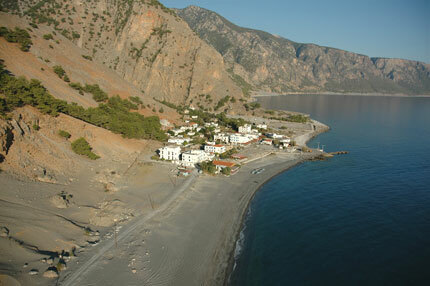 Agia Roumeli is the small coastal village that you reach after walking through the Samaria Gorge. 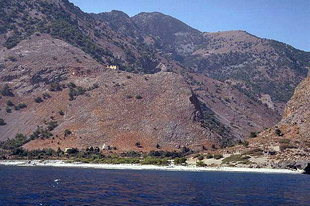 A frequent boat service takes you directly to Loutro and Hora Sfakion. 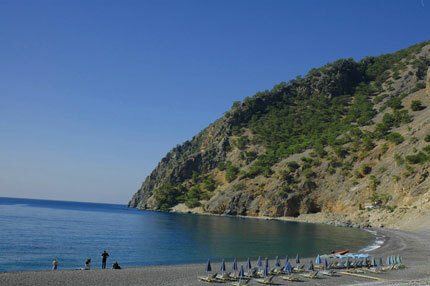 Agia Roumeli has various hotels, rooms, and tavernas. In May 1941, the Greek government of Emmanuel Tsouderos and King George left Greece from here when Crete fell to the Nazis. 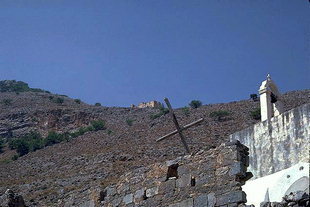 Agia Roumeli was destroyed by the Turks in 1867 after the battle of Aradena. However, the Turkish did not manage to penetrate the defence of the canyon where all the women and children were protected. The same had happened in 1866. The ancient Greek site of Tara, is on the left (east) hill as you exit the gorge. Many of the finds from Tara are in the Archaeological Museum of Chania. Tara flourished in Greek, Roman and Byzantine times. It was an independent city and it had a glass producing factory. 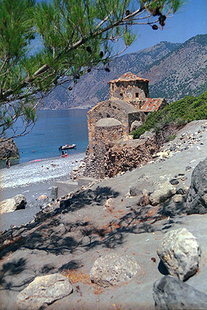 In Agia Roumeli are the Byzantine churches of the Panagia, Agia Triada, and Agios Pavlos, a Turkish castle, and a beautiful beach.